Security has been a specialty of ours from the very beginning. 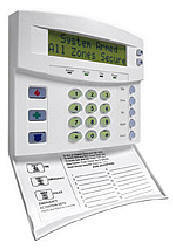 Our alarm division can custom design and expertly install a 24-hour Central Monitored Burglar and Fire Alarm to meet any requirement or budget. Our professional operators will keep watch over your security system status from a top UL rated locally based Central Monitoring Station day and night. Ready at all times to call the police, fire department or any other emergency authorities. We can also expertly install a backup radio transmitter that will send an alarm signal to our central station even if your phone lines are down or cut! Completely concealed wiring and quality false alarm-free components are what you can always expect from us. Our expert service department, which is second to none, compliments all of our systems. Interested in keeping an eye on the baby’s room, seeing who’s at the front door or what the kids are doing by the pool? Then our discreetly installed Video Surveillance System is the perfect solution. Visually monitor entrances or rooms on any TV or monitor in your home. Our security systems are more than burglar alarms. They can include Water sensors, Carbon Monoxide detectors, Smoke detectors or Temperature sensors. Call us for all of your security and camera needs and we will design a reliable, easy to use, affordable system that will offer you peace of mind for years to come. i-See Video and 2 indoor infrared dome camera's INSTALLED for $750.00 with $14.95 per month monitoring charge.